A guard passes a picture of imprisoned Aung San Suu Kyi on the front gate of the British embassy in Jakarta, Indonesia. Yangon, Myanmar (CNN) -- Myanmar's ruling junta announced Wednesday a new election law that disqualifies pro-democracy leader Aung San Suu Kyi from participating in upcoming national elections. The Political Parties Registration Law, announced in state-run newspapers, excludes electoral participation by any member of a political party who has been convicted in court. A Myanmar court convicted Suu Kyi, 64, in August for breaching the terms of her house arrest after American John Yettaw swam uninvited to her lakeside house in Yangon and briefly stayed there. Her ongoing detention was extended to November 2010, and in February a court rejected her appeal for release. Suu Kyi's supporters have said the conviction was a way to remove her from the election campaign. The Nobel Peace Prize laureate has spent 14 of the last 20 years under house arrest. The new law forces Suu Kyi's party, the National League for Democracy, to choose between honoring her as its leader and risking the party being declared illegal or ejecting Suu Kyi from the party and contesting the election. The party has 60 days to decide its course of action, but party spokesman Nyan Winn said Wednesday that the party would not comply with the new law. Suu Kyi, the face of democracy in Myanmar, also known as Burma, was placed under house arrest in 1989. The next year, her party won more than 80 percent of the legislative seats in the first free elections in the country in nearly 30 years. But the military junta disqualified Suu Kyi from serving because of her house arrest and never recognized the election results. The junta has promised to hold elections -- which would be the first since 1990 -- later this year, touting them as a step toward democracy. No polling date has been set. At the United Nations, a spokesperson for Secretary-General Ban Ki-moon said in a statement that the organization was studying the laws. "The indications available so far suggest that they do not measure up to our expectations of what is needed for an inclusive political process," the statement said. In Washington, a U.S. State Department spokesman said the law makes a mockery of the democratic process. "Given the tenor of the election laws that they've put forward, there's no hope that this election will be credible," P.J. Crowley told reporters. "We are deeply disappointed with the political party law which excludes all of Burma's more than 2,000 political prisoners from political participation," he said. "We are also troubled the law appears to bar National League of Democracy leader Aung San Suu Kyi from running. It may also prohibit her from membership in her own party. This is a step in the wrong direction." Still, he said, "We will continue our outreach and our dialogue, not because we expect it to solve this instantly. Burma has to figure out how it wants to advance. It's obviously struggling to do that." If Myanmar wants to build its credibility with the rest of the world, "it has to find a way to have a process where it has meaningful dialogue with ethnic groups and other political movements," he said. Amnesty International urged Myanmar to overturn the new law. "There are at least 2,200 political prisoners in Myanmar, most of whom are in prison simply because they tried to exercise their rights peacefully," said Benjamin Zawacki, Amnesty International's Myanmar researcher. 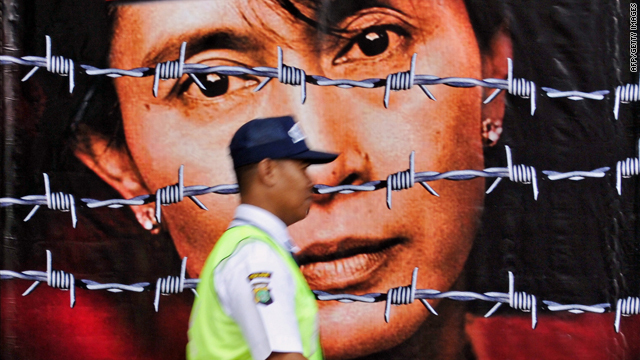 "Instead of passing laws that strip away more of their rights, the Myanmar authorities should immediately release all political prisoners, including Aung San Suu Kyi, and remove restrictions on their political activity." The new government stipulation is the latest political hurdle for Suu Kyi. She was already banned from becoming president by Myanmar's recently amended constitution, which prohibits presidents and their parents, spouses and children from owing allegiance to another country. Suu Kyi was married to British academic Michael Aris, who died in 1999, and had two sons with him. The United States considers Myanmar's military regime repressive for cracking down on political opponents, the most prominent of whom is Suu Kyi. However, after years of refusing direct talks with the reclusive nation, Washington has recently indicated a possible re-engagement.